Hey, from Austin, TX. It has been just too cold in Bloomington for my blood, so when J had a conference here this weekend, I tagged along. It’s warm and breezy here and such a terrific city – I’ve been strolling the streets and falling in love. Yesterday I walked down to the state capitol – such a lovely graceful old building. I got goose bumps like I always do at the majesty of our experiment in popular government. Then I worked myself up, thinking about how much power privilege carries in this country – GWB, son of a pres., moving from Austin to DC while his brother ran things in Tallahassee, with plans, no doubt, to move on himself. Hillary running with all the support of the vast Clinton political establishment. If she wins two terms and then Jeb wins two, we could have a 38 year stretch where all our presidents were named Bush and Clinton, just because they inherited the machinery and connections to win the office. I don’t think that’s what the founders had in mind. I hope not anyway. I want to vote for someone who is as awed by the whole enterprise as I am. I want to vote for someone who gets goose bumps too. The man can really get a crowd worked up; the energy there was impressive. When I left I had those goose bumps again, and judging by the conversations I was eavesdropping on, I wasn’t the only one. A quick query to Lisa, who was zinging recs for Amy’s Shiner Bock ice cream my way which she heard about here), got the puzzled response, “Yes, it’s still there. Why?” Long story short, the sisters who started Las Manitas couldn’t afford a new sign when they moved in so the place is actually called Las Manitas Avenue Café. Who knew? Migas is a Mexican breakfast dish made from fried tortillas and eggs and I am a huge fan. Las Manitas is the first restaurant I’ve ever been to that actually had them on the menu, though. Sometimes I can talk Mexican places in Indiana into making them for me, but they have never tasted this good. Usually I just make them at home. After breakfast we were walking back to the hotel when we saw the unmistakable signs of a farmers market setting up. I am a sucker for markets so we hung around until it was show time and did a little shopping. It’s not a producer-only market, but vendors do have to grow or make what they sell. Got some adorable dog treats (www.pawbakery.com) and some dynamite granola (www.jakesnaturalfinefoods.com). Also some excellent Brazos Valley cheese (a pepper jack – the guy even grows the peppers for it - some provolone and some marinated mozzarella), and a fiery hot sauce from Taco Deli – jalapenos blended with olive oil (www.tacodeli.com). It looks creamy but it’s sharp and hot and delicious. What else? There was natural pork producer, and a grass fed lamb farmer, but I wasn’t trying to get that stuff in my suitcase. Then my eye was caught by a sign that said “Grass Fed Chocolate.” Okay, I’ll bite, I said. What the heck is that? Just nonsense, the guy replied, but now that I have you here, want to hear about our great chocolate? He toasts cocoa beans and coats them with a thin layer of white chocolate, a layer of milk chocolate, and one of dark (www.cocoapuro.com.) Wow. Bought some for me and some for my friend David. How the heck are we going to get all this stuff home? Guess I’ll worry about that tomorrow. And migas...Mmmm. A staple on almost every breakfast menu in the part of the world. Some places even offer red, green or both. Did you get to Amy's? She and I went to grad school together! Sigh, swoon. I dream about Las Manitas' refried beans...I'm glad you were able to try them. We never got the Shiner Bock ice cream, Renee. 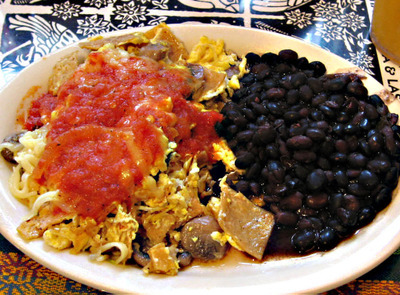 But Las Manitas also had red and green chilaquiles -- another thing I crave. Never got to Amy's, Alanna. Small world, huh? I'm amazed I didn't see you walk into the Roaring Fork as I work right across the way in a nice little high rise. Sorry I did not know you were going to Austin - one of our faves is Maria's Taco Express on South Lamar - truly a legend and great migas. And if you ever get back, check out HEB's Central Market (there are two) - second only to the capitol for tourism - awesome markets. and Lisa (Homesick Texan) would you send me your e-mail - got some questions. Sorry I didn't know you were there, Gin -- I'd have waved! Larry, wish we'd had those recs, though truthfully we had so little time I'd just have felt bad for missing more good things. NExt Time! And thanks for the migas recipe! If you go to Lisa's site I think you can contact her that way. Cheers! so sorry that i didn't keep up with my blog reading... i'd have known you were in austin! it's just a hop, skip & a jump from me. so did you get to try the shiner bock ice cream? it's amazing... austin is truly a magical place, isn't it? glad you fell in love! OK... have you MOVED to Austin? If so, I understand. It is a good place. But don't people eat and take photos there too?